Another day has passed at Horseshoe Southern Indiana where a WSOP Circuit stop is currently taking place, and it has produced a plethora of thrilling stories from the poker tables. 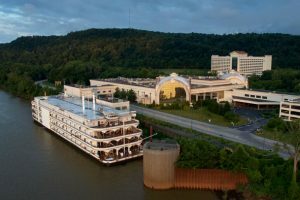 But what was perhaps the biggest story of that day was defending Horseshoe Southern Indiana Main Event champ Justin Boggs vying for a back-to-back title at the riverboat casino. Day 1B of the $1,700 Main Event was played on Saturday. It saw Boggs enter it to make it through the 15 levels played throughout the day, and finally bag and tag 255,500 at the end of the night. Boggs thus secured a spot among the top 15 chip stacks into Day 2 of the prestigious tournament. Precisely a year ago, Boggs swept through the field of the $1,675 Main Event at Horseshoe Southern Indiana for his first WSOP Circuit gold ring and a cash prize of $139,920. There are two more days of play within this year’s edition of the tournament and it is yet to be seen whether the player will be able to defend his well-deserved title. The Main Event drew a total of 389 entries this year who generated a prize pool of $589,307. The top 45 spots will get paid, with min-cashes starting from $2,663 and going all the way up to the first-place prize of $129,953. Day 1B of the tournament was busier than the first starting flight. Tournament records show that Flight B drew 223 entrants to add to the 166 competitors who registered into the Main Event through Flight A, played at the host casino on Friday. The second, and final, flight was wrapped up with 43 hopefuls bagging and tagging for the night. Michael Shanahan was the player who emerged as the chip leader last night. 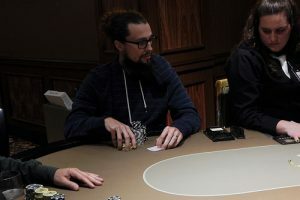 He put 374,500 worth in chips in his bag to top not only the Flight B leaderboard but also the overall chip counts chart, meaning that the player will enter Day 2 action in the comfortable position of the overall chip leader. Melih “Turk” Birdal ranks second in the overall leaderboard with 356,000. The player entered the competition through Flight B. Day 1A chip leader James Hill is rounding out top three of the chip counts chart with 343,000. Day 2 action is set to kick off at 1 pm local time. The 43 survivors from Flight B will be joined by the 31 players who made it through Day 1A for a day full of quality poker action. The players will fight for a paid spot as the money bubble is expected to burst at some point today. The final day of the tournament will be played tomorrow at the host casino. The survivors from today will gather for the last time to play down to a champion.